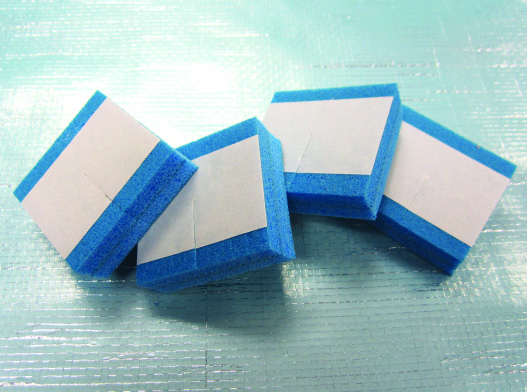 Trade Select™ Ametalin Cavity Spacers™ are fire-resistant XPE foam blocks, used to achieve and maintain reflective air spaces between reflective insulation and the adjacent material in your construction system. Each cavity spacer has adhesive backing for ease of application, and a slit which allows for easy placement and repositioning over wall ties and surfaces. Trade Select™ Ametalin Cavity Spacers™ have strong holding power and won’t deteriorate over time. Double Brick and Cladded Wall Cavity Spacers. Trade Select™ Ametalin Cavity Spacers™ are designed for use in wall or roof systems in residential, commercial and industrial applications. They are used in conjunction with reflective insulation membranes to maintain adequate reflective air spaces in the wall or roof system. Use slit in cavity spacers to adjust and align over wall ties to ensure proper water drainage. Adhesive backing adheres to reflective membrane to hold in place.